Surprisingly, Lavatch’s previous Listener was as recent as last December and that required me to cut holes in my completed grid to leave the shape of a snowflake. [It was only when I received the annual stats that I found that I had made a mistake in my submission. What was especially annoying was that it was in one of only twelve cells in the outer ring of 48 which remained after surgery.] Hopefully, I wouldn’t make any mistakes this week, although the empty carte blanche grid that was staring me in the face looked menacing. 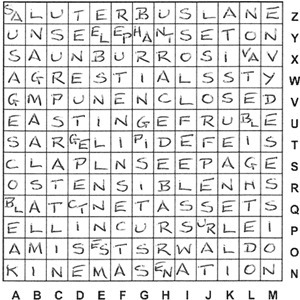 In this carte blanche, clues were listed with columns (downs) first followed by rows (acrosses). What’s more, the rows were ordered bottom to top. Even by the end of the puzzle, I don’t think I really got the hang of this, and was constantly looking for a clue in the wrong place. In addition, there would be seven blank cells, three clashes and fourteen misprints. To say that progress was slow would be an understatement. After two hours, I only had a dozen clues solved, and even having Q1 NET ASSETS didn’t seem to help much. With so few entries, it didn’t initially seem worth trying to fit them in the grid, but I eventually felt I had nothing to lose. I tried H1 BARRE and X BURROS starting in the same square, but H2 (7) wouldn’t have fitted unless the grid was cyclic, but we weren’t given any indication of that. However, I also had I FEEL and W1 AGRESTIAL and E NILL and Q1 NET ASSETS. The first pair could end in the same square, and symmetrically the second pair would both start together. Excellent! Of course, that started a huge wild goose chase trying to fit everything around them. This, together with the other wrong assumption that the central row would be words of 4-, 3- and 4-letters in that order, delayed me nicely, thank you Lavatch! I eventually threw all that out of the window, and moved NILL down in column E and FEEL up in column I, and realised that the central entry was LIDE with a blank cell in the middle. Gradually things started to come together, as the tricky clues revealed themselves. I particularly liked Z1 In recital, one sacking musician leading to LUTER, sounding like ‘looter’. At first, I was a bit unsure of O2 Device from lab, initially, a lot of money’s invested, ending with nothing which was WALDO. Here money’s had to be read as money has, not money is. Hold on…that was a total of 15 misprints! I spent another It turned out to be the last one, Z2 Endlessly kiss jazz singer, one going part of the way? (7, two words), where I thought it should be one going part of the day! The first two instructions were straightforward: SA VA GE PI CT UR ES filled the empty squares two at a time, and BLIGHTED, BLEAK and BARREN resolved the ‘unhabitable’ down entries. Finally, elephants had to replace towns. At first I looked for places like EPSOM and DOVER which could be replaced by JUMBO or BABAR. Of course, TOWNS was sitting there in the middle of the second row, and putting EL EP HA NT S with two letters per square (apart from the S) gave new words. I now pondered for several days over the exact meaning of “All cells affected by these changes are filled in a particular, consistent manner…”. How particular did it have to be. I had just put them in as I normally did, with one letter in the NW quadrant of a square and the other in the SE. That way, the ‘savage-pictures’ and ‘elephants’ read smoothly across, the ‘unhabitable downs’ read smoothly down and the new words read smoothly across or down as appropriate. If I missed something relevant I’ll be shocked. So, a real toughie, but well worth the struggle. I will add Lavatch to my list of setters who send a shudder down my spine. This entry was posted on 16 August 2013 at 4:00 pm	and is filed under Solving Blogs. You can follow any responses to this entry through the RSS 2.0 feed. You can leave a response, or trackback from your own site.